Ridiculous? : Is There A Problem Here? : Ridiculous? aravindajith - Most ridiculous error of the decade! portfolia - @aravindajith That drives me absolutely crazy. I don't believe warning users that a site may not be compatible with their browser is ridiculous -- if it actually isn't compatible. However, I don't think that's the case here. I tried this site with IE7, Firefox 3.5, and Chrome. I got no warning dialog with IE7. I got two of them with Firefox. And with Chrome, I got one warning dialog. I then explored the site and found nothing that failed to work with Chrome or Firefox. A quick look at the page source reveals checks for browser names of WebTV and Navigator that trigger error dialogs. I thought that, perhaps, this check for WebTV and Navigator is code that's been on the site for a very long time. So I took a look at the WayBack Machine and discovered that the code was likely added around January 2007. 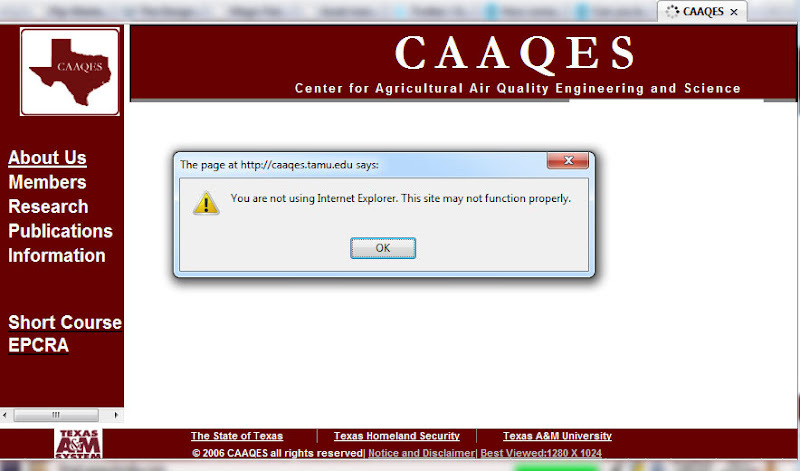 Perhaps a lot of people use WebTV in Aggieland.